Giratina fighting Dialga in the Reverse World. For what reason are these two fighting one another? The next stop on our journey through the Diamond and Pearl subseries of films brings us to Giratina and the Sky Warrior, known in Japan as「ギラティナと氷空の花束 シェイミ」(lit. “Giratina and the Sky’s Bouquet: Shaymin”). Premiering in Japanese theaters on July 19, 2008 and on American television on February 13, 2009, this film continues the unique movie trilogy that began with our previous film, Dialga vs. Palkia vs. Darkrai. Darkrai kicked the series off in exciting fashion and left me eager for more in spite of my bias against that generation of Pokemon games. Does Giratina and the Sky’s Bouquet: Shaymin (hereby Giratina) continue the precedent set by Darkrai? Let’s take a gander. A lone Shaymin timidly walks through a forest to drink from a nearby lake. While Shaymin drinks, a portal appears in the sky above and Dialga appears. Dialga also begins to drink from the lake, but another portal appears from the lake’s surface. From the mysterious Reverse World, Giratina flies through the portal and attacks Dialga, dragging it down through the portal into the Reverse World. Shaymin is caught up in their fight and is dragged through the portal along with the two powerful Pokemon. While the two fought, a cloud of black smoke passes over Shaymin, which it begins to inhale. Shaymin has the ability to cleanse the air of impurities and can channel that energy as an attack called Seed Flare. When Dialga and Giratina brought their fight closer to Shaymin, Shaymin unleashed Seed Flare in self-defense, knocking them both away. At the same time, Shaymin’s seed flare creates a new portal which flings Shaymin out of the Reverse World and back into the normal world. Dialga tries to follow through this newly created portal, but Giratina drags it back into the Reverse World once more. Dialga, in a final effort to escape from Giratina, shoots an energy blast at it and leaps through the now-closing portal. Giratina uses its own powers to open up another portal to pursue Dialga, but it finds that it cannot dive through it. 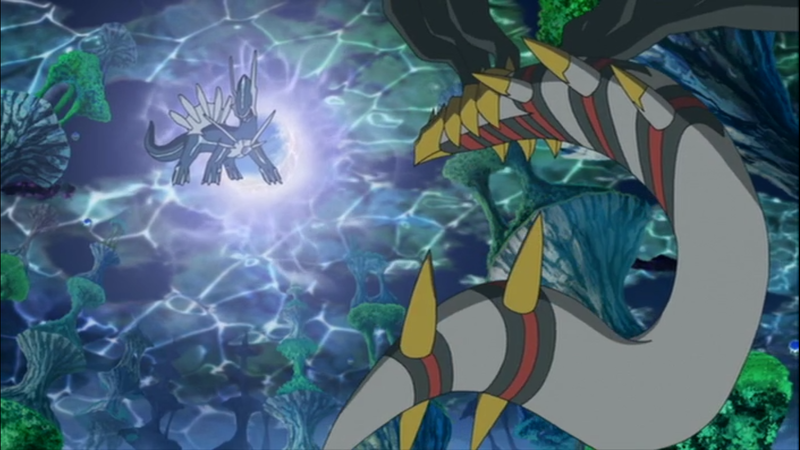 Dialga uses its powers to warp time around Giratina, resetting Giratina back to a previous time state every time it attempts to leave the Reverse World. Meanwhile, Shaymin finds itself dragged by the currents of a river after exiting the portal. It eventually stops at a town formed at the mouth of the river, where our heroes, Satoshi (Ash Ketchum), Takeshi (Brock), and Hikari (Dawn) are eating breakfast. Shaymin stumbles upon the group, hungry and notably exhausted from its encounter with Giratina and Dialga. The group take Shaymin to the nearby Pokemon center, where Shaymin makes a full recovery. Shaymin informs them that it’s on a migration path towards a field of Gracidea Flowers, a type of flower which Shaymin naturally resemble. Shaymin insists that Satoshi help it reach this flower field and leads them towards the general direction. Meanwhile, Giratina manages to track the group down and drags them into the Reverse World. The group tries to fend off Giratina, but all of their attacks harmlessly deflect off of Giratina’s body. Thankfully, they receive aid from a man named Mugen Graceland (Newtwon Graceland), a scientist who has dedicated his life to studying the Reverse World. Graceland guides them through the terrain of the Reverse World and they manage to shake off Giratina for a little while. Graceland explains that the reason Giratina is hunting Dialga has to do with Dialga and Palkia’s battle in Alamos Town, referring to the events of Movie #10. Their battle severely impacted the real world, and in turn, the Reverse World. Giratina’s duty is to preside over the Reverse World, which exists to maintain the stability of the real world. Since the battle between Dialga and Palkia transcended regular space-time, the damage it caused affected the Reverse World directly, creating clouds of poisonous gas to form. In order to teach Dialga a lesson, Giratina has actively hunted it down to show it the damage it caused the Reverse World. Graceland helps the group locate a dimensional tear in the Reverse World that the group could use to return to the real world and warns them to avoid reflective surfaces as that is how Giratina sees into the real world. However, the instant the group emerges in the real world, they are confronted by a mysterious man named Zero who attacks them with a small army of Magnemite, Magneton, and a leader Magnezone. The group runs through the town in order to escape, and manages to board a train heading towards a nearby harbor. At the harbor, they board a boat that leads towards the northern Gracidea flower fields, but along the way, Giratina manages to track them down and once more drags them into the Reverse World. Zero and his Magnemite family pursue the group through Giratina’s portal and capture the group as well as Graceland. As he commands, the Magnemite bring the captured members into a poison cloud. Shaymin, realizing that the humans and other Pokemon cannot breathe the toxic fumes, begins to filter the air around it to remove the poison. Giratina, having located the group, flew towards the group, scaring Shaymin and causing it to use Seed Flare and releasing a portal back to the real world through which everyone and Giratina pass through. This was all part of Zero’s plan to release Giratina into the real world so that he may capture it. Zero calls a large airship that fires a high-energy laser at Giratina, immobilizing it before a cage descends and imprisons Giratina. 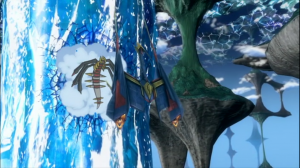 Graceland reveals that he designed the airship, stating that he and Zero created it together to copy Giratina’s power. However, knowing that doing so would cost Giratina its life, Graceland sabotaged the project and wiped all data surrounding it. Zero reconstructed the mechanism from his memory and is trying to copy Giratina’s power to rule over the Reverse World. Satoshi, Hikari, and Graceland fly up to the airship using a hoverboard that Zero left behind. While Hikari and Satoshi keep the Magnemite family busy on the deck of the airship, Graceland infiltrates the main computer room and quickly begins hacking into the mainframe. He succeeds in stopping the processes of the ship, including those involved in copying Giratina’s data. The airship crashes into the ground and Giratina is freed, but badly injured. Shaymin, empowered and transformed by the pollen of the Gracidea flowers nearby, uses its Aromatherapy ability to heal Giratina. However, just as things stabilize, Zero appears once again from the wreckage of the airship piloting a smaller fighter plane-esque aircraft. This ship was designed by Zero to fully utilize Giratina’s copied abilities. Though the copy process did not fully complete, he analyzed enough of Giratina’s data to freely travel between the real and Reverse World as well as upgrade his weapons to match Giratina’s power. Zero uses the ship to head into the Reverse World, destroying critical parts that directly connect it to the real world. 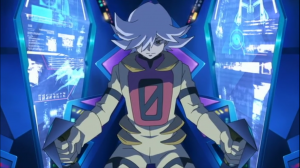 Zero’s actions cause a glacier to crack and melt, greatly accelerating its descent down a mountain. Its progress would crush a town at the foot of the mountain, and the Pokemon of the forest as well as the legendary Regigigas who resides on the mountain, come together to halt the progress of the glacier. Meanwhile, Giratina, Satoshi, and Shaymin make their way into the Reverse World to stop Zero. Because of its injuries, Zero’s ship proves too much even for Giratina, and Zero knocks Giratina away and turns his attention to Satoshi and Shaymin. He thinks once more to poison Satoshi in a cloud of poison gas, but Shaymin purifies the air. The two of them realize that they need to vacate Zero from the Reverse World and Shaymin prepares to unleash Seed Flare, but Zero tries to stop Shaymin. Fortunately, Giratina musters enough strength to hold Zero’s ship back and gives Shaymin the time to channel Seed Flare. The portal drags Shaymin and Zero out of the Reverse World and back into the real world. 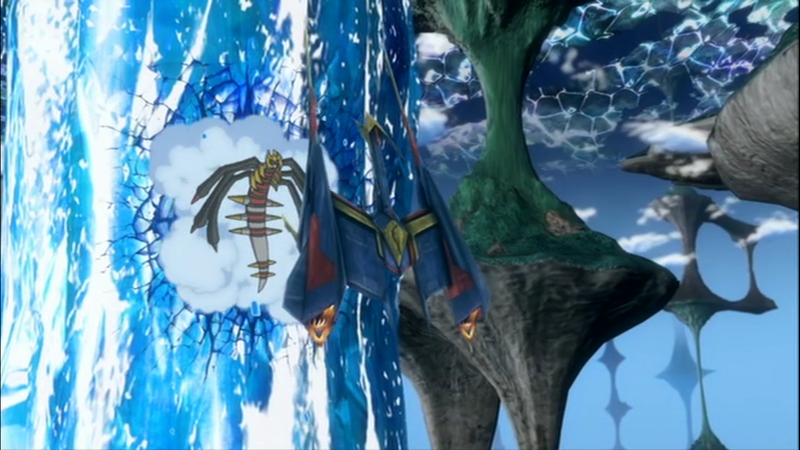 The transition causes Zero to lose control of the ship, crashing into the glacier where Hikari has her Pokemon freeze the ship using Ice Beam. With Zero gone, Giratina with the help of Satoshi restore the broken parts of the Reverse World, stopping the advancing glacier from crushing the town. After delivering Satoshi back into the real world, Giratina flies off, once again in search of Dialga. The following day, Shaymin finds that the rest of its pack found its way to the Gracidea field and it says a tearful farewell to Satoshi, Hikari, and Takeshi. After Shaymin flies off, the group continues on their journey, but not before sending a bouquet of Gracidea flowers to their families. Shaymin held up next to a bouquet of Gracidea flowers. The resemblance is uncanny! First, let’s take a look at the two co-starring Pokemon of this film. First, Shaymin. After eleven movies, the adorable titular Pokemon is expected to speak and interact with the main cast members. It’s a staple of the series at this point. Shaymin fits that mold, but still manages to stand out. The talking Pokemon we’ve seen up to this point fit in one of two categories: Either they were cutesy innocent things that acted like small children, or they were angry, gruff, and serious. Shaymin doesn’t really fit into either of these templates. Instead, Shaymin comes off as an arrogant Pokemon. The world is its oyster. It treats Satoshi almost like a master would treat a servant, riding on his head and saying such things as “You should be thankful to me!” when it helps the group escape sticky situations. This sounds annoying on paper, but it surprisingly works in the context of the movie. Shaymin is charmingly written and animated, with distinct quirks and mannerisms that make it likeable. The haughty personality of this tiny hedgehog-like Pokemon shines as unique and memorable. Giratina fights Zero’s new aircraft in the Reverse World. I’m far less impressed with Giratina’s portrayal in this film. Remember my biggest complaint with The Power of One? I was disillusioned with Lugia because of how weak the film portrayed it. Giratina suffers from that same impotency problem. As a Pokemon who has obvious connections with godlike Dialga and Palkia, I expected far more earth-shattering power from Giratina — particularly because the previous movie did such a good job of this with Dialga and Palkia. Instead, from the beginning, Giratina seems feeble. When Giratina scuffles with Dialga in the beginning of the film, Dialga shrugs off Giratina’s attacks and — on the whole — seems more annoyed than threatened. Consider this specifically: Dialga disables Giratina’s signature power, the skill to move between dimensions, by using its own ability to bend time. This wouldn’t be so bad if it weren’t for the fact that Giratina is literally powerless to rid itself of Dialga’s affliction. Instead, it had to rely Shaymin to free it. It’s pathetic really: What does it say about a primordial, supposedly godlike Pokemon that needs to rely on a scrawny little hedgehog? Zero sits in the cockpit of his experimental fighter jet. That jumpsuit looks incredibly lame. I can’t pin all of the film’s woes on Giratina, though. the film’s antagonist, Zero, proved equally offensive. In fact, the problems may be related. I wouldn’t be surprised if I discovered that the scriptwriters intentionally handicapped Giratina just to make Zero seem slightly more effective. It’s a sound idea, I suppose, but in execution, it results in one of the messiest, most pointless villains in the entire Pokemon movie franchise. Let’s think about Zero’s motivation. He was an assistant to Graceland in their studies of the Reverse World and witnessed Graceland deleting the plans for their Reverse World-traversing machine such that they could let Giratina live. Zero was, for some reason, devastated by this. Up to this, I can at least follow his rationale. 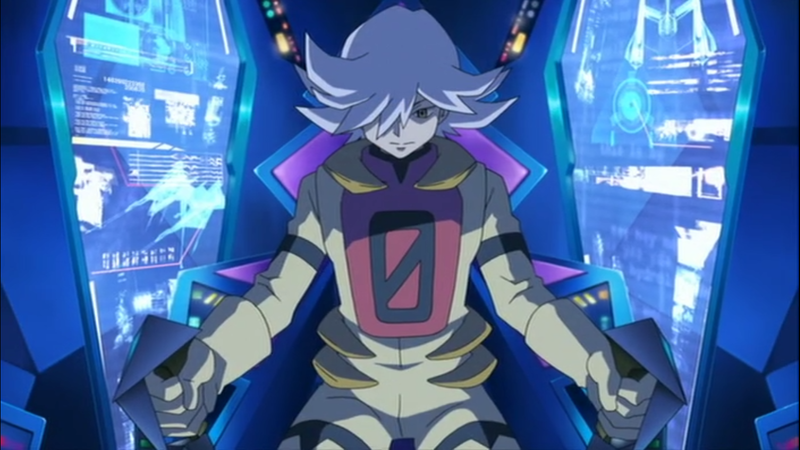 Then things get weird: Suddenly, Zero unveils his intentions to rule over the Reverse World. He vows to use its power to destroy the real world… even though he KNOWS that neither world can exist without the other. Huh? And though I get that he wanted to extract Giratina’s abilities to reach this goal, why did he feel the need to design a dimension-hopping jet fighter and wear a jump suit that are both colored and themed to look like Giratina? Did he want to become Giratina or something? Zero’s motivations made absolutely no sense and I spent the entire credits sequence trying to piece together just why he was even included in this film in the first place. On the whole, Giratina isn’t a bad watch. Starting with Diamond and Pearl, the Pokemon Company has done a fantastic job at least ensuring that their films are easy to watch and tolerable from beginning to end. However, Giratina’s seems to spend too long showing off Giratina and Shaymin for product advertising, and not enough time doing trivial stuff like telling a coherent story. 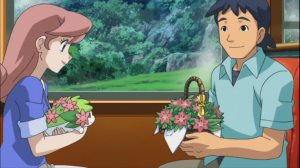 Though, to being quite frank, if this movie was just a 90 minute ad for Giratina and Shaymin, and had left out the muddled character of Zero entirely, I think it actually might have turned out better than what we got. At least then the film would’ve had some kind of obvious purpose. But, as it stands, we’re left with a wishy-washy villain and a wasted opportunity.